Jam out with Five Stone when they drop by Finley’s to rock the house! Music starts at 8:30pm and they’ll be followed by the talented DJ Charizma at 11pm to keep you dancing all night! Celebrate Easter right here at Finley's during our Easter Sunday Brunch Buffet! Enjoy our all you can eat buffet for $34.95 per person and half priced for children 10 and under. You'll get delicious food options to choose from and a complimentary Bloody Mary or Mimosa. Get unlimited Bloody Marys or Mimosas for $18! There will be three seatings at 11am, 12:30pm and 2pm! Call us today to make your reservations at 631-351-3440! Jam out with The Nubs at Finley’s this Saturday night! Music starts at 8:30pm. Don’t miss DJ Lexx afterwards to keep you on the dance floor all night long! Don’t miss the talented No Stone Unturned band when they perform for us right here at Finley’s! Music starts at 8:30pm and they’ll be followed by DJ Charizma at 11pm! Check out The Little Plains Band when they rock the house right here at Finley's! Don't forget, DJ Charizma will be here afterwards to keep you dancing all night! The music at Finley's is about to get a little outta hand! Don't miss The Outta Hand band perform for us at 8:30pm! Afterwards, DJ Charizma will be here to keep you on your feet all night long! Who's ready to jam out with us and The Plastic Device tonight? Hang out with us all night long and you can also catch DJ Lexx when she starts spinning for us at 11pm! There's no better place to jam out than right here at Finley's! Join us to see Midnight Crisis! If you stick around, DJ Charizma will start spinning to keep you dancing all night long! Hey ladies! 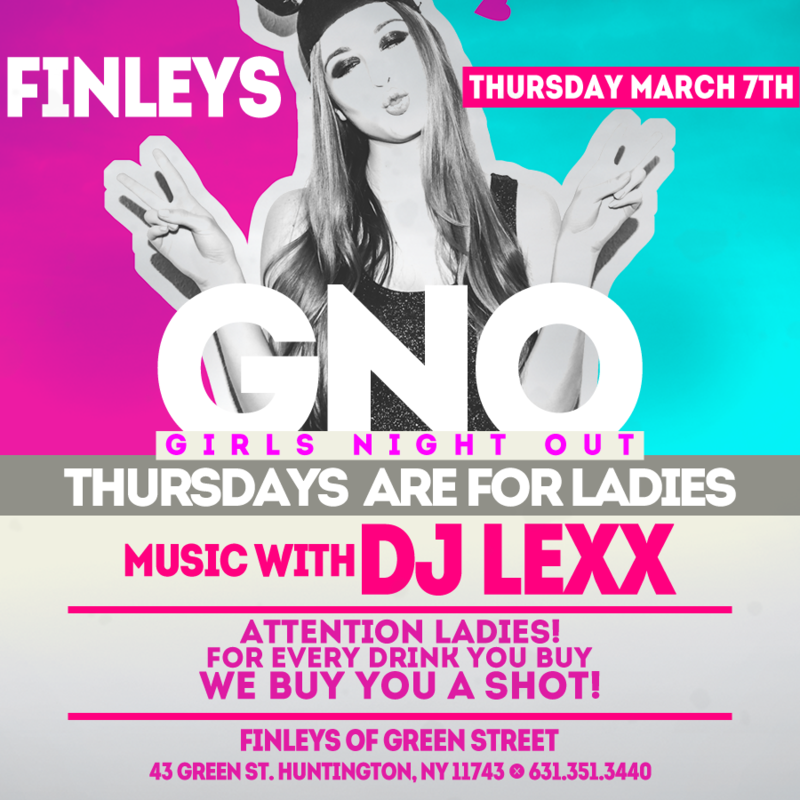 Bring your girlfriends down to Finley’s for a Girls Night Out! For every drink you buy, we’ll buy you a shot! Get ready to party with awesome music from DJ Lexx and delicious drinks all night long! There's no time to waste! Lost Time is performing at Finley's and you've got to catch their sweeeet sounds! Music starts at 8:30pm. Later on, we'll have DJ Charizma laying down some awesome tracks you won't want to miss! Get on the dance floor at Finley's when Barrage arrives to start the Friday night fun with us! Afterwards, DJ Charizma will be here to keep you on your feet all night long! Music starts at 8:30pm. Hit the dance floor with DJ Lexx every Thursday night for a Girls Night Out! For every drink you buy we’ll buy you a shot! Get ready to hit the dance floor all night long with us! Join us at Finley's for St. Patrick's Day! We'll have a delicious brunch and dinner menu available that you won't want to miss. Let us fill your glass with Guinness and start your celebrations! Who's ready to celebrate St. Patrick's Day? 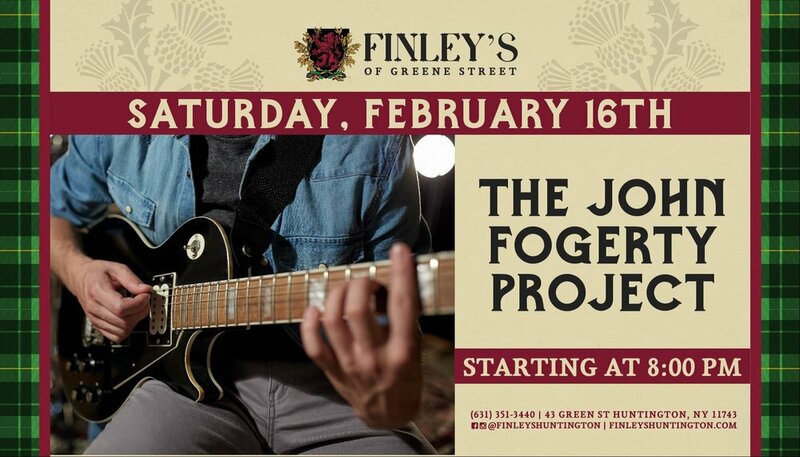 Hang out at Finley's for our St. Patrick's Day Bash with the John Fogerty Project kicking off all the fun! Jam out at Finley's when Minus One performs for us! Music starts at 8:30pm. 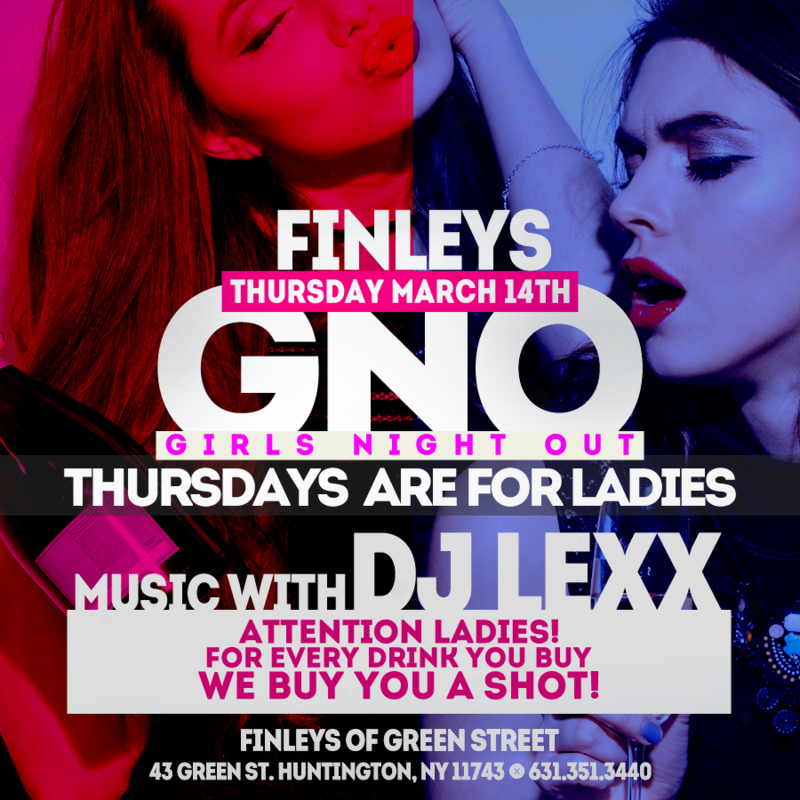 Attention ladies - don’t miss out on a Girls Night out at Finley’s! For every drink you buy, we’ll buy you a shot and while you’re here we’ll have DJ Lexx dropping some serious beats to keep you dancing all night long! 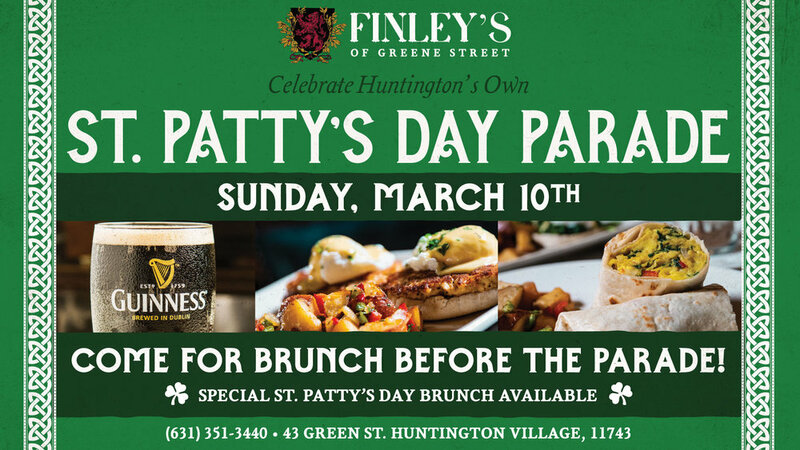 Come hang out at Finley's before the St. Patrick's Day Parade here in Huntington! Join us for a delicious brunch - we'll have a special menu available that you won't want to miss. Check out The Taylor Brothers when they jam out with us this Saturday night! Music starts at 8:30pm. 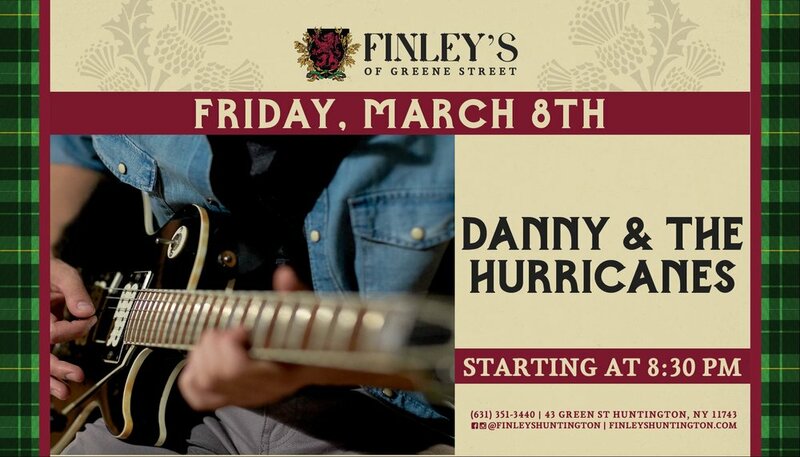 Don't miss some rockin' music right here at Finley's with Danny & The Hurricanes! Music starts at 8:30pm. Join us on Thursday, March 7th and bring your girls along for one seriously fun girls night out! We’ll have DJ Lexx spinning some legendary tracks that you won’t want to miss. Let’s get dancing! We’re bringing some Billy Joel down to Huntington! Join us here at Finley’s for The River of Dreams - a tribute to The Piano Man himself! It starts Friday, March 1st at 8:30pm - don’t miss it! DJ Charizma spinning all night longggggggg! Hang out with us at Finley’s and rock out with Illusion, A Tribute to Women Who Rock! We’ll see you there, music starts at 8:30pm! DJ Charizma rocks the house spinning all your favorite tracks! Jam out here at Finley’s when Tony Barca’s Bucket List Trio is here! Music starts at 8:30pm! Get ready to bring the house down with The John Fogerty Tribute Project! We’ll have you movin’ and groovin’ all night long and to keep you on the dance floor, we’ll also have DJ Charizma hanging out with us at 11pm! Don’t miss Under the Covers when they rock out with us right here at Finley’s! Later on, to keep you on your feet, we’ll have DJ Charizma here to lay down some sweet tracks! 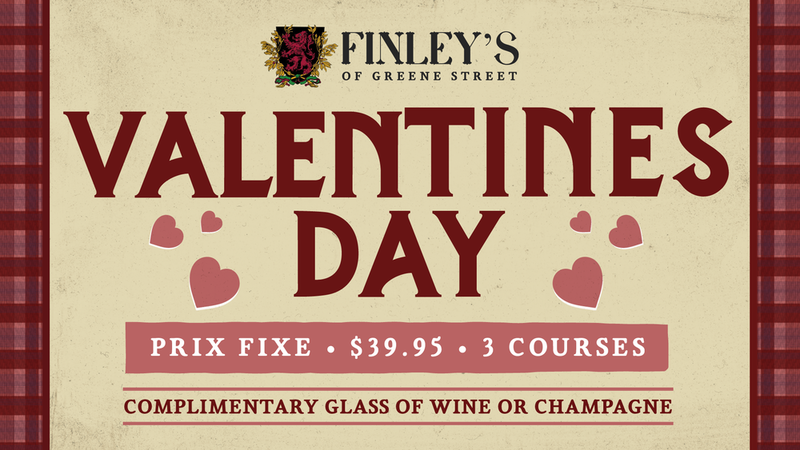 Spend your Valentine's Day right here at Finley's! We'll have a three course, $39.95 Prix Fixe menu for you to enjoy with your special someone! With your meal, we'll also give you a complimentary glass or wine or champagne! Check out our menu here! Sweeten up your weekend when you see Wild Honey jam out with us tonight! Be sure to stick around and catch DJ Lexx afterwards at 11pm! 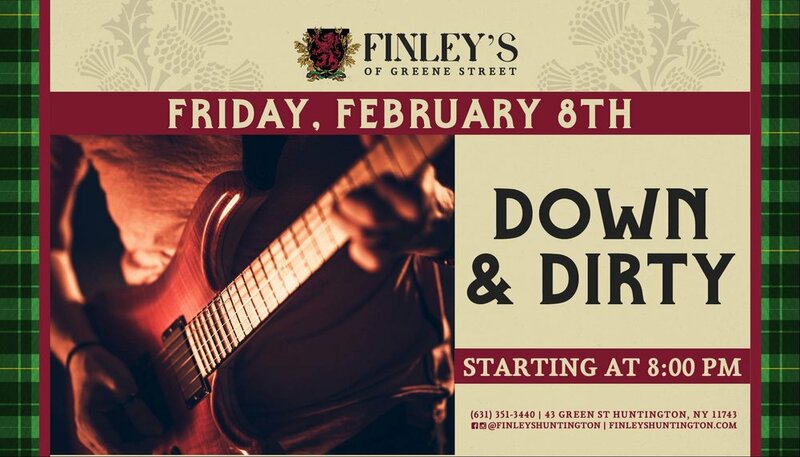 Get ready to rock when Down and Dirty come to Finley’s! After their set, be sure to catch DJ Charizma when he stops by to spin some sweet sounds at 11pm!